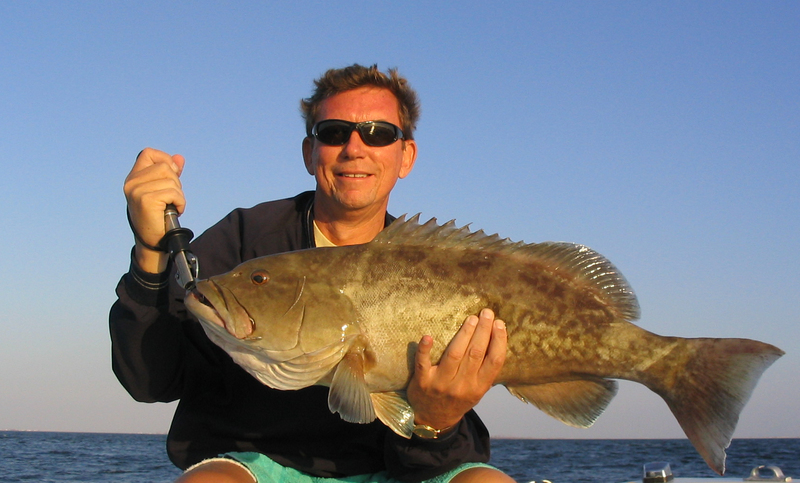 We had an outstanding fall with lots of blue sky, low humidity, and clear water. 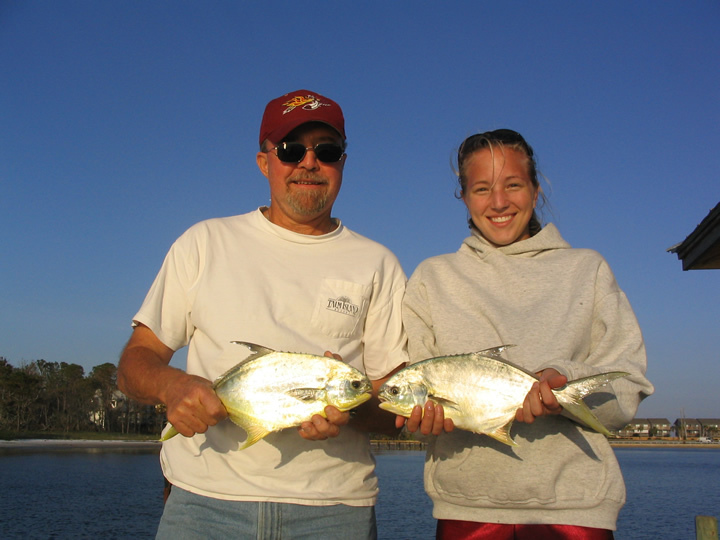 With water temperatures warmer than average, our summer species were slow to depart. 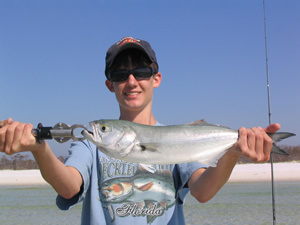 Flycasters caught jack crevalle, pompano, Spanish mackerel, ladyfish, bluefish, redfish, and black drum. 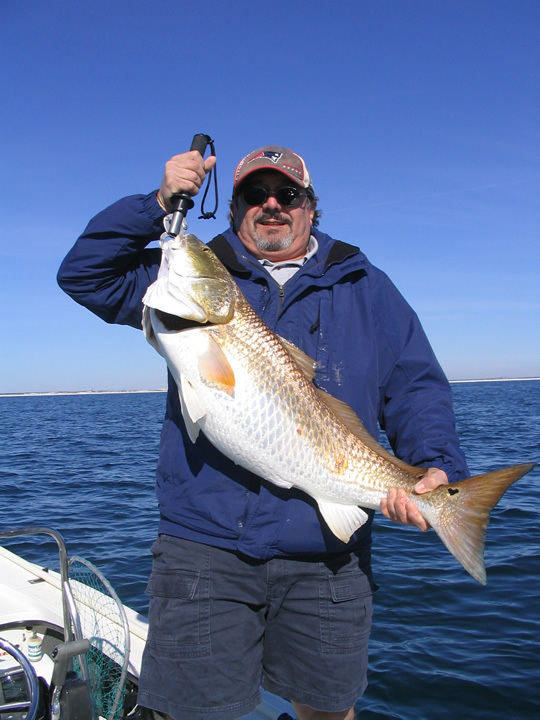 Big schools of bull redfish finally hit the surface Thanksgiving week, and continued to provide explosive top-water action throughout the season. 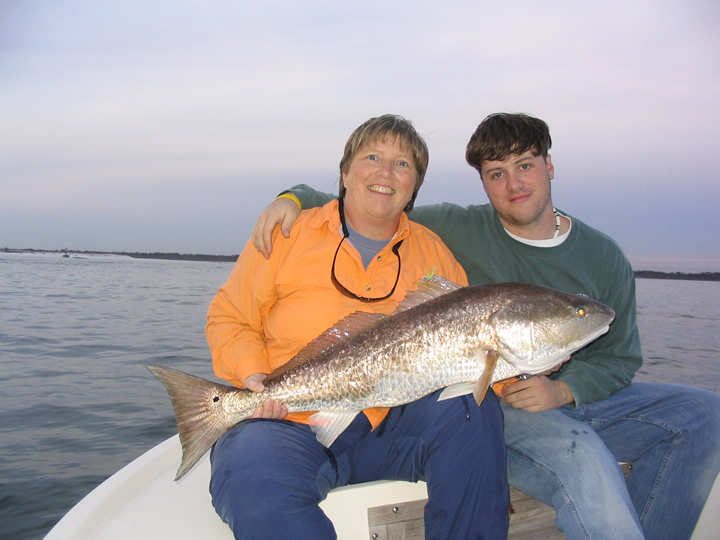 Check out the photos below for the three 2005 boat records landed in the fall. 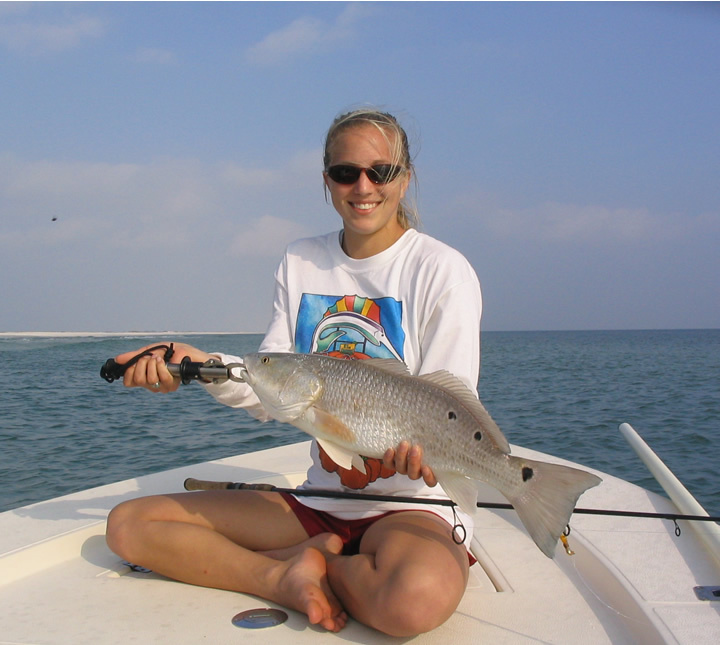 For other examples of the year's action, see our Photo Gallery for Winter 2005, our Photo Gallery for Spring 2005, or our Photo Gallery for Summer 2005. Click here to return to the 2006 gallery. Click on any of the small images below to see the full size photos. Use the back button on your browser to return to this page. Tennessee's Ed Wright landed this 26 inch redfish on a Travis Akins' popper. 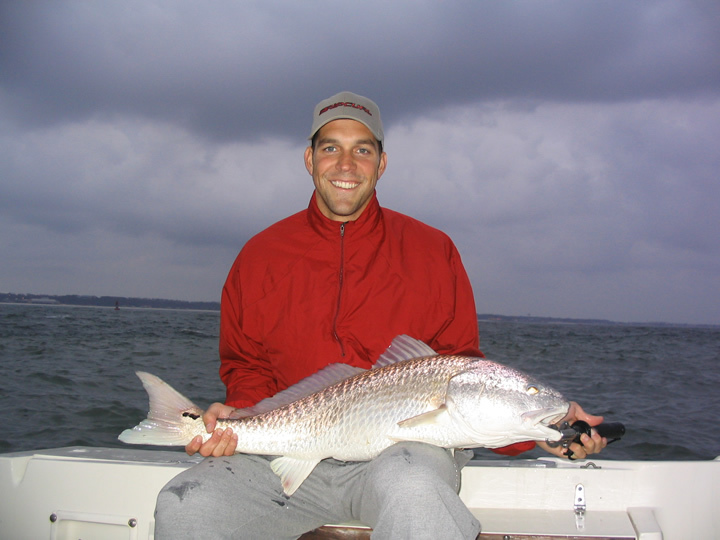 He is assisted by his Navy flight school roommate, Evan Wright (no relation). 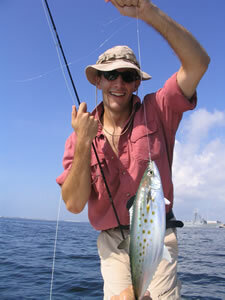 Ed Wright and a nice Spanish mackerel caught on Feather-Craft's "Salt Shaker" fly. 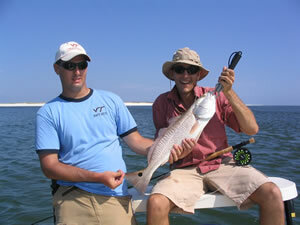 Fish City - a typical feeding frenzy in Pensacola Pass. 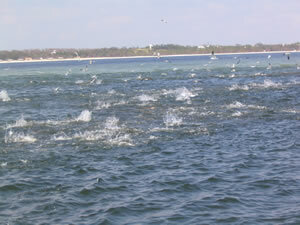 These are ladyfish and redfish crashing bay anchovies. 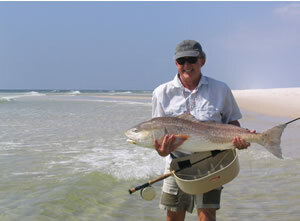 Greg Speer, Lillian, Alabama, with the 2005 boat record redfish on a fly, caught on a "Pompano Rocket" while sight fishing for pompano. 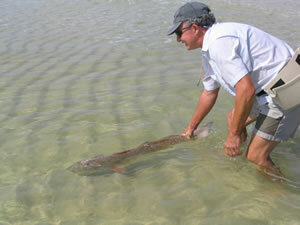 Releasing Big Red to fight again another day. 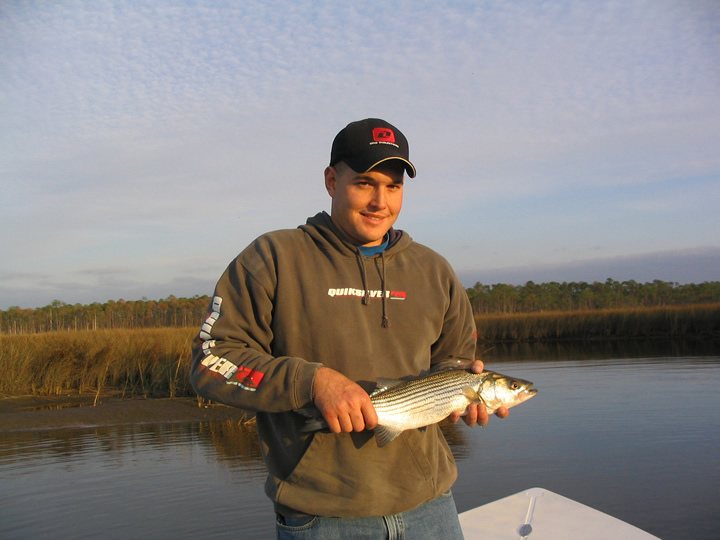 Colin Dinken of Birmingham, Alabama, and hard fighting bluefish landed October 10. 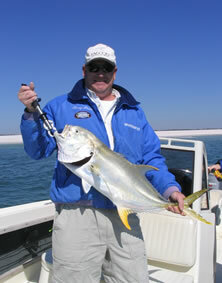 Terry Repp of Crestwood, MO and his first jack crevalle, a twenty pounder caught on a topwater plug. October 27. 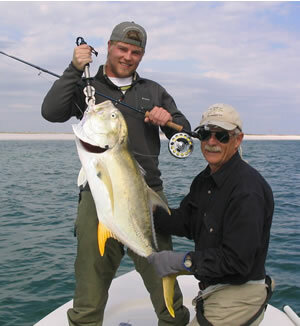 Ben Walters from Johnson City's Fly Shop of Tennessee gets an assist from his dad, Dave, after landing this 21 pound jack crevalle on a ten weight. 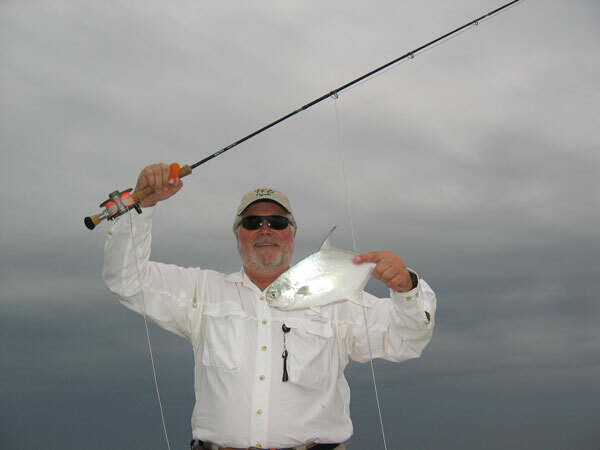 Stephen Larson of Lawrenceville, GA and a lovely Halloween pompano. October 29. 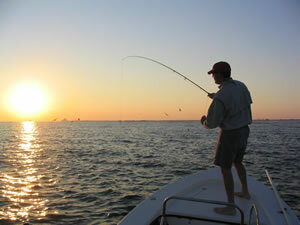 Alpharetta's Brian Whitman finishes off a great day fighting ladyfish at sunset. 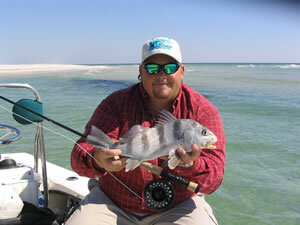 Captain Clif Jones from Orange Beach, Alabama catches his first black drum on fly. 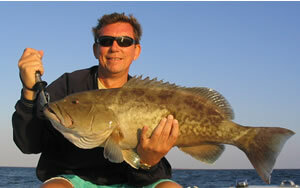 Darrel Kalbfleisch and the 2005 boat record grouper, caught November 1 in Pensacola Bay. 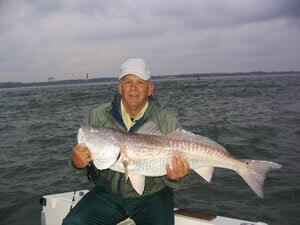 Darrel rounded out the trip with this 28 pound redfish. FSU-bound Lizzy Mabry landed this slot sized redfish while outfishing her dad on a beautiful November 9th. 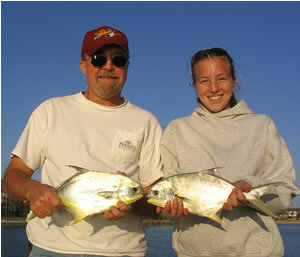 Mike and Lizzy Mabry with a pair of skillet-bound pompano. Doug Pinkerton of Santa Paula, CA, and one of five striped bass caught on top water plugs and released November 19. 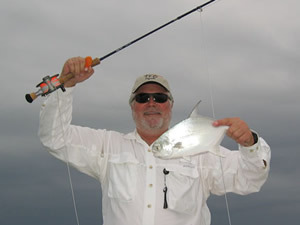 Rick Pope, President of Temple Fork Outfitters, and his first pompano on fly caught November 20. 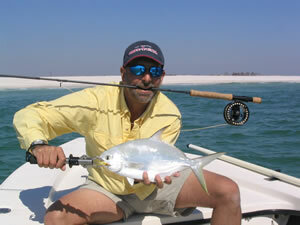 There's a "pompano rocket" somewhere in that pompano's mouth. 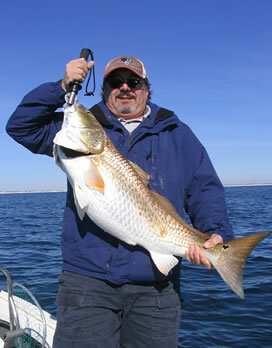 The bull reds were surface feeding when Ken Parham of Franklin, MA, landed this 21 pounder. The heart on this fish's tail is an "ILY" message from daughter Sophia. 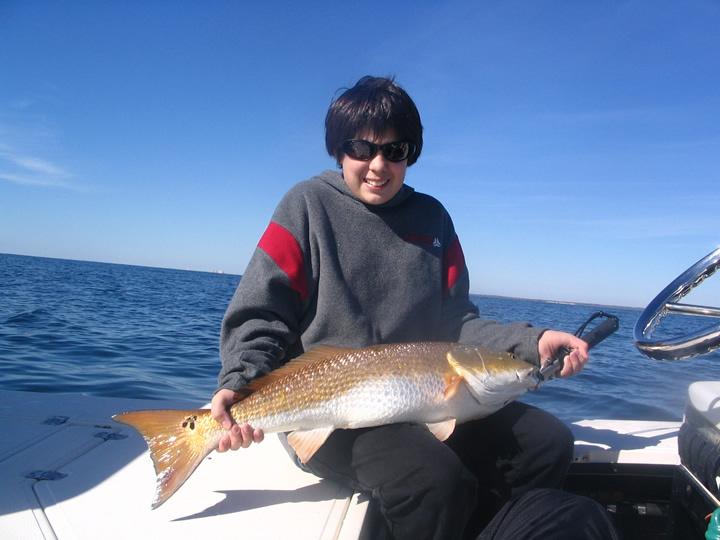 Twelve year old Patton Parham hooked, fought, landed, and released this twenty pounder .... his biggest fish ever. 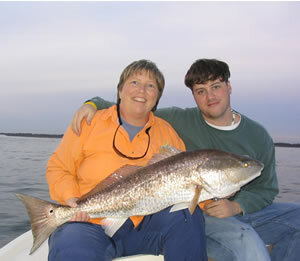 Daphne, Alabama's KA Turner and fishing buddy Jason Blanks with a late-in-the-day redfish landed on November 25th. 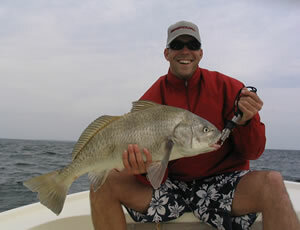 November 26: Ash Spurlin of Mary Ester, Florida and the 2005 boat record 14 pound black drum caught and released in Pensacola Bay. 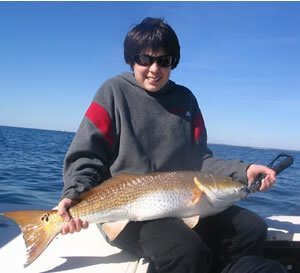 Ash's entry in a father-son fishing competition November 26 at Pensacola Pass. 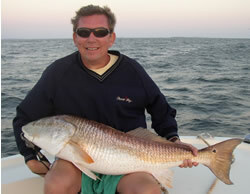 Lynn Spurlin of Richmond, VA, overtook son Ash with this terrific 25 pounder landed just before sundown.